Saturdays from 1:00-5:00 pm. Check our website for updates. 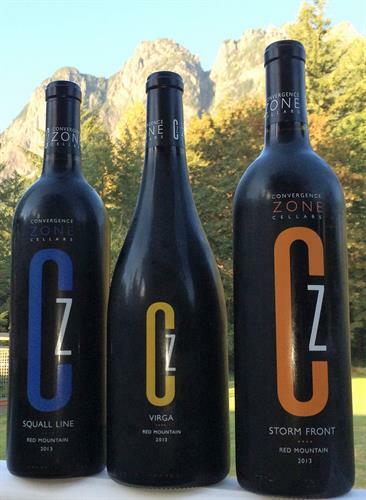 Convergence Zone Cellars is a small family-owned and operated winery located in North Bend producing quality wines from premium grapes. Our current offerings include Sunbreak Chenin Blanc, Drizzle Pinot Gris, Three Forks Rose', Storm Front Red Blend, Squall Line Red Blend, Mistral Grenache, Virga Red Blend and Fly Rod Cellars Red Blend. Our red wines are mainly from Red Mountain AVA grapes--the premium grape growing region in the state. Stop by and visit our winery in the Silver Creek neighborhood of North Bend where you can see where we make our wines, talk with the winemaker and sample our wines.